Competitive pressures often cause a reduction in prices, in spite of continually rising costs. A decrease in prices paired with increased costs quickly eliminates any profitability and threatens your company's ability to survive. This book shows you how you can reduce costs through the elimination of waste caused by poor communication and coordination throughout a company as well as between the company, its suppliers, and its customers. The author explains Enterprise Resource Planning (ERP) in non-technical terms, describing how an ERP system can fully integrate all functions in your manufacturing organization. He demonstrates the system's capability to increase efficiency and profitability - and to delight the customer - as well as its current deficiencies. In addition to his thorough coverage of ERP, the author introduces Total Enterprise Integration (TEI), the process of integrating all the information required to fully support a manufacturing company. TEI represents a logical extension of complete information integration throughout a manufacturing enterprise and into the supply chain. This new concept shows you how the intelligent use of work flow allows responsibility to go to the most appropriate front-line decision makers while maintaining proper budgetary and operational controls. The power of TEI is in the integration of communication across the entire manufacturing company, and out through the supply chain to customers and suppliers. 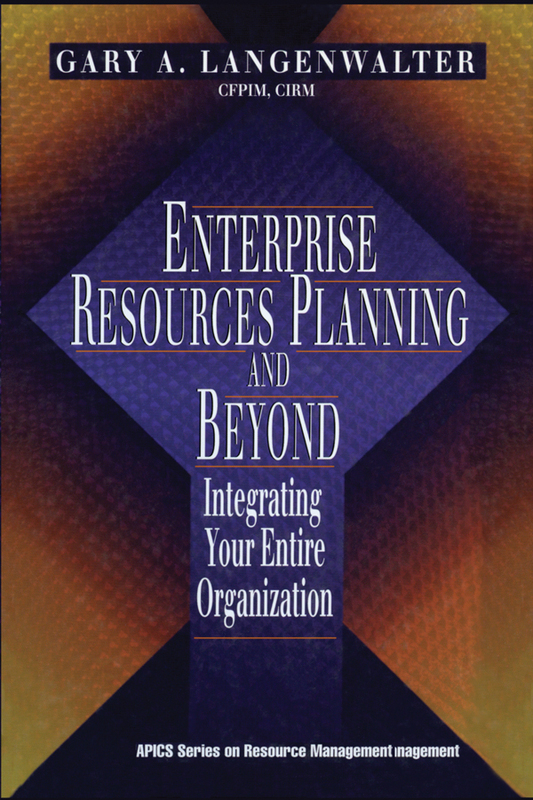 Enterprise Resource Planning and Beyond: Integrating Your Entire Organization focuses on what a fully integrated system can do for you. "This book is outstanding! If I had to put stars beside all of the excellent ideas, my comments would have looked like the Milky Way." "…an indispensable guide to an enterprise-wide system! Use this book to plan and implement an ERP system, avoid pitfalls, and understand its power. Your customers will expect you to have ERP and your competitors will have it." -Karen Jones, Manager of Business Processes and Systems, Tropicana Products, Inc.
"A must read for every manager and executive who is seeking to maximize the benefits of ERP in their company…a comprehensive, easy-to-understand, nontechnical exploration of ERP and how its elements work together. It should be a standard reference on the desk of every executive and professional in a manufacturing company." "…uniquely integrates ERP with customers and suppliers into the entire supply chain, providing the framework for a quantum leap in customer-driven performance of the entire organization." "Chock-full of practical how-to's and watch-out's…written for the professional who is serious about substantial improvements. It offers detailed direction for achieving world-class manufacturing excellence…the author has provided an important service to the manufacturing community." "Must reading for anyone selecting or implementing ERP software…anyone involved in an ERP project will find this text most helpful…a fine introductory text for the ERP newcomer, as well as a fine thought-provoking text on advanced processes for the ERP professional." -Robert A. Abair, Senior Partner, Robert Abair Associates, Inc.